Happy Monday! I hope you had a great weekend! I'll be sharing more about our weekend tomorrow because even despite the stormy weather, we had such a fun one! Today is the first day of my girls' spring break and I am really looking forward to the slower pace this week. We have plans for the park, the zoo, and some spring cleaning (they don't know about that one yet). I always look forward to spring break and I'm very excited that my spring break and theirs aligned this year! 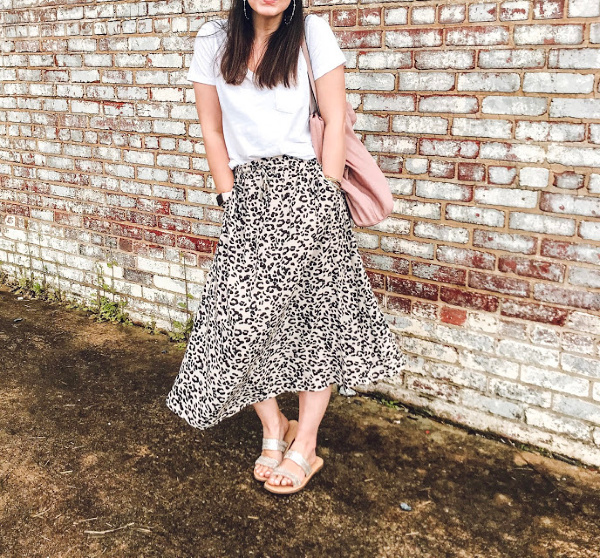 Today, I'm sharing an outfit from the weekend that I wore to go to the antique mall and out to dinner downtown. 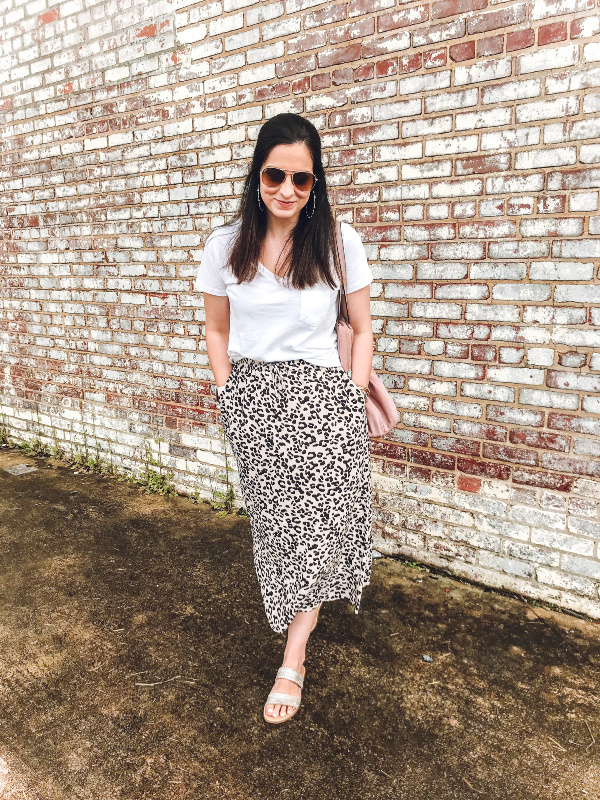 With bolder pieces, like this skirt, it can be intimidating to create an outfit that doesn't look too dressed up or too over the top. 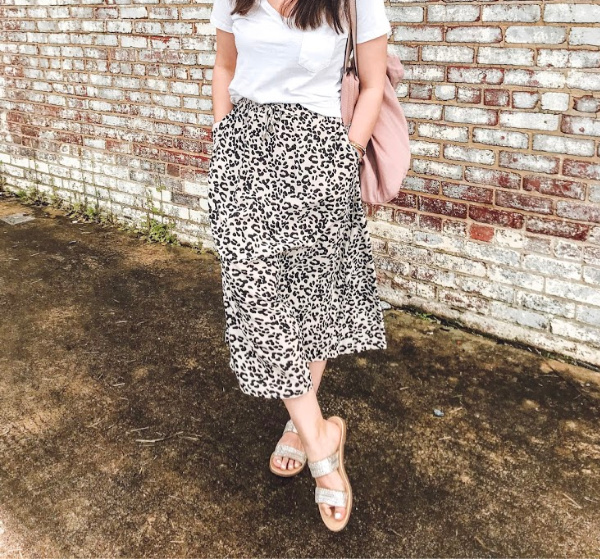 I used to avoid buying bold pieces like this because I wasn't really sure how I would make it work, especially for my casual lifestyle. 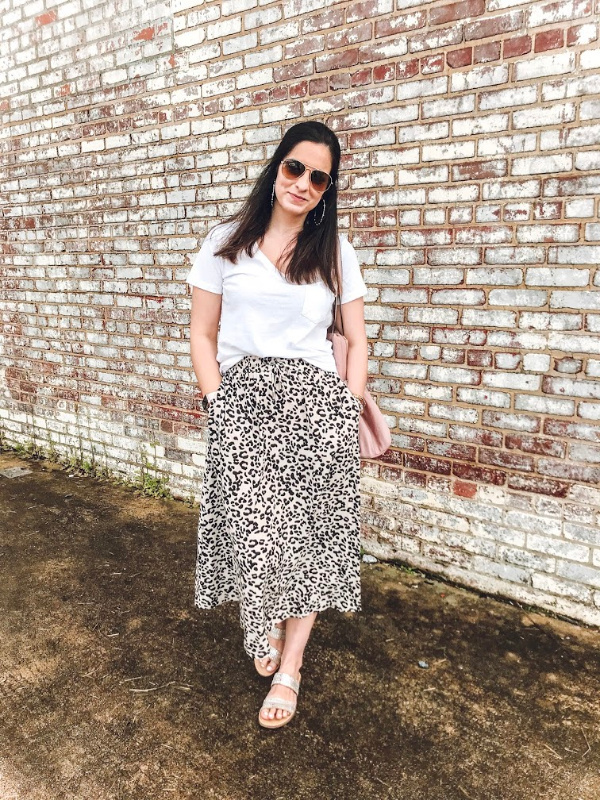 But like I mentioned in my spring outfit formula post last week, my favorite way to balance out a statement piece is with a white tee. You could definitely wear any color tee but I just personally really love a white tee. I literally find myself grabbing one to wear several times a week! I feel like it makes the outfit look comfortable, relaxed, and like well, you're not trying to hard (if that makes sense). I added slide sandals for comfort while we walked downtown, hoop earrings, and a pop of color with my bag to complete the look. I did bring my denim jacket with me just in case it got chilly but I didn't end up needing it. I love leopard and denim together, too! 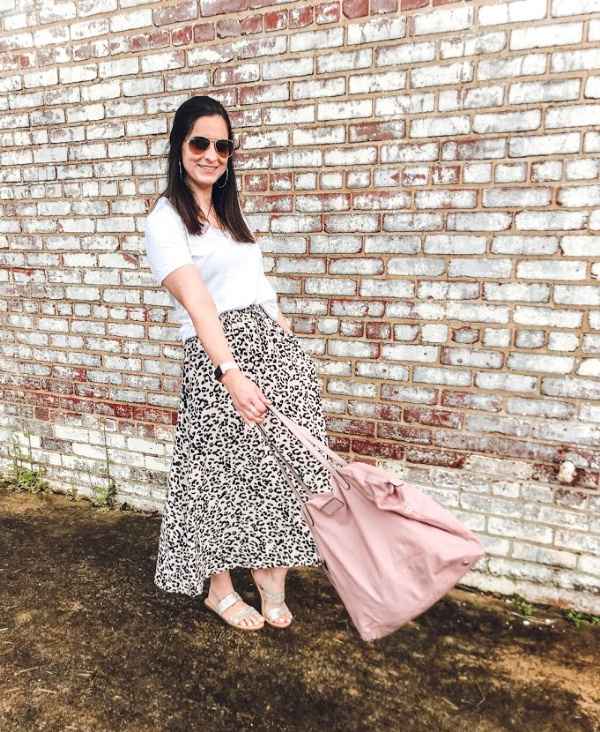 I wish I would have bought a leopard skirt a long time ago because it was so much easier to style than I thought it would be! 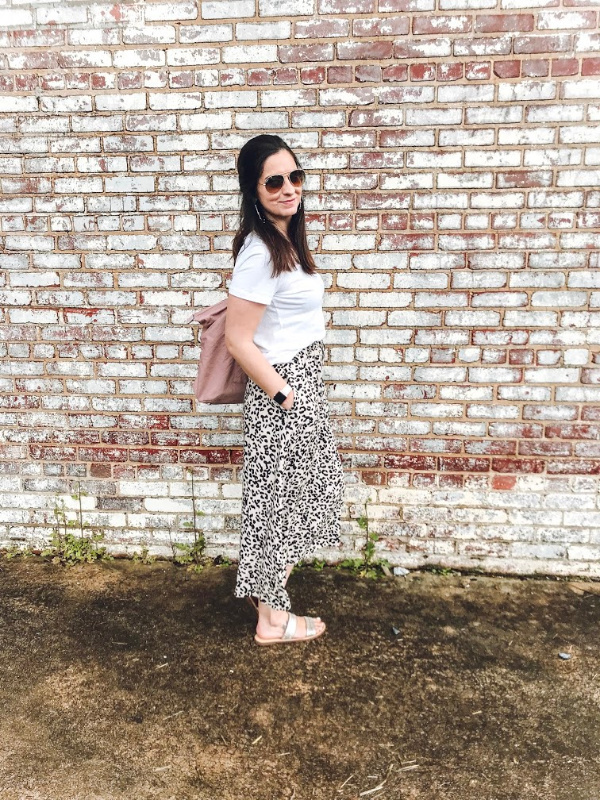 I felt so put together yet comfortable in this spring outfit! 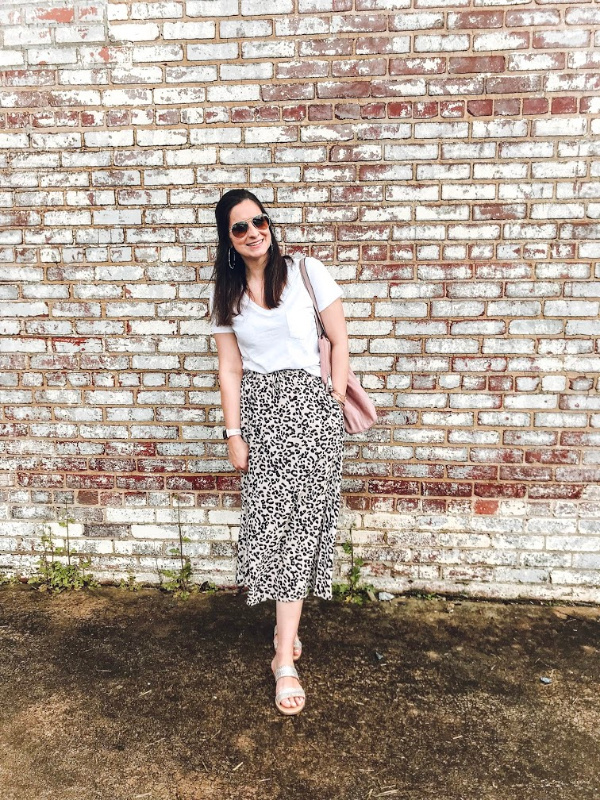 Totally kicking myself for not snagging this skirt before it sold out. Love that it's so easy to dress up or down!